I am Hrant Yesayan, born on (January 26, 2002). I am a 3rd year student at “Tavush State Regional College” for the “Finances” profession. In 2017, due to my high academic achievements and active participation in student projects, I was chosen to be a member of the student council and later its president. In 2016, Anoushavan Abrahamian Education Fund had established in our school an “Armath” engineering laboratory, where robotics classes are being held. This laboratory has been a blessing as it enables us to learn about programming, robotics and 3-D modeling. It gives a new quality to the academic processes in our school. 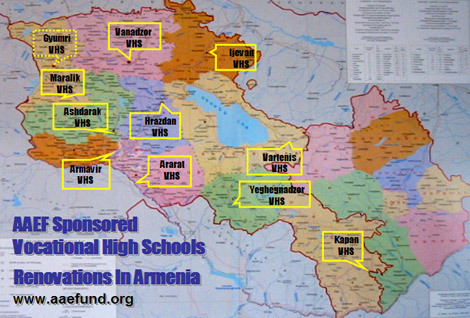 Very recently, Anoushavan Abrahamian Education Fund has donated to our school a “Ford Transit” model school bus, which serves the various initiatives organized for our staff and students. Indeed, the school bus serves its purpose, as the students and staff have conducted multiple study visits to various historical-cultural places throughout Armenia. On behalf of all students in our school and me personally, I would like to thank Anoushavan Abrahamian Education Fund for the tremendous support provided to our school.